I have a text message.It's the end of the world and I have a text message.Why am I not surprised? Of course the end of the world would happen and everyone would be doing whatever they could in order to hold onto the last charge on their phone, just in case that one important text message comes through.3.5 stars. My advice is that you go take a spin through all of the 4 and 5 star reviews first before reading mine. I'm going to be the rare fly in the ointment who isn't completely satisfied with what was trying to be accomplished here.This is Not a Test was a good book. I'll even write it again. 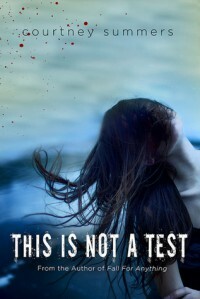 This is Not a Test was a good book. It was a decent realistic fiction which takes place in a post-apocalyptic world book. Yes, I did go there. I'm throwing down on the genre definition. I was warned that the story was more about the inner workings of the characters, which didn't bother me at the time. I like reading books in which people have to battle their own inner demons. In that aspect, the story was well-crafted. But a zombie book? I really don't think that it was. And something about that fact really frustrated me. Anyone can take a scenario, call it end-of-the-world and then use it to throw people together in order to put them through a sort of mental hell. But when the world really doesn't extend past characters being trapped in a building, it makes me want to cry foul on the whole zombie take. Call it a natural disaster. Call it nuclear war. Call it anything but a flipping zombie book. People read zombie books because they want to see some semblance of horror or devastation. And I'm not talking about emotional devastation.This was not a zombie book. This was NOT a zombie book. THIS WAS NOT A ZOMBIE BOOK. And I'm still sort of pissed at that. However, I did like This is Not a Test, even though I honestly couldn't tell you why. The characters were all broken, no one really came across as likable, and the ending had us wishing we knew what was next to come. I guess this goes back to the author being able to craft a well-written story. This is how I wish Never Let Me Go had ended - not perfectly wrapped up but at least leaving you with a tiny shred of hope.This one line did drive the point of the book home. Hold on to what you have while you still have time to appreciate it :You can lose everything in seconds.